I LOVE the beginning of the month! It's time for new goals, new plans and new STAMPS from some of my favorite companies!!! 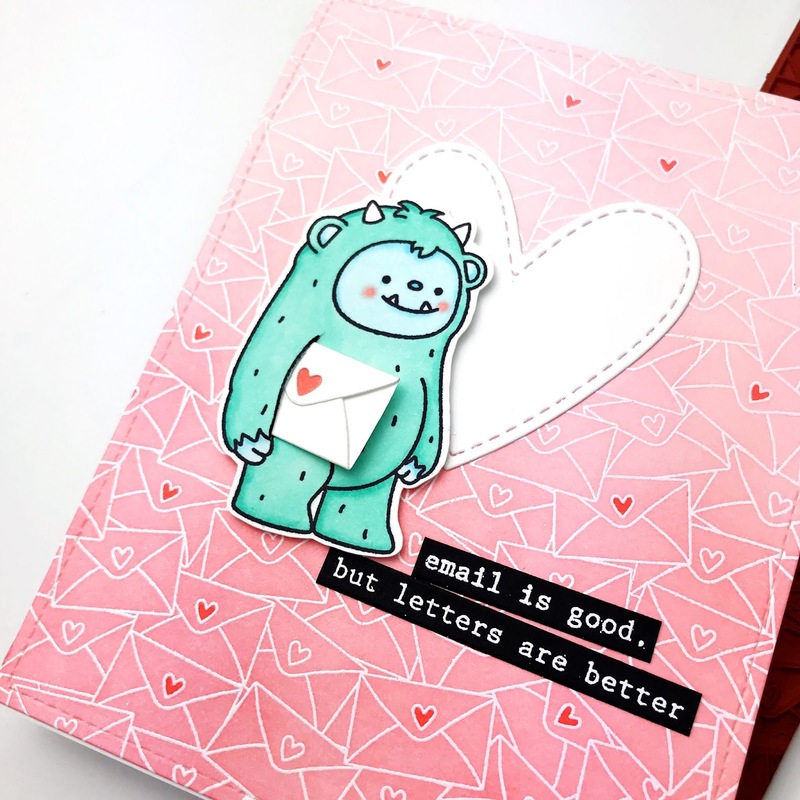 Today our Neat & Tangled team is sharing some sneaks of the new Mail Background stamp and coordinating dies coming out this Friday! I love this sweet happy mail background!!! For this card, I embossed it in white and ink blended over the top. The adorable little happy mail envelope die cut fit perfectly under yeti's arm. I just used a craft knife to cut a slit between yeti's arm & body so the envelope would slip in. tucked under his arm. He's sweet! under his "arm". Cute card. Such an adorable card! Love the envelope tucked under the yeti's arm - so cute! Awww!!! Your card is totally cute!!! Love the colors!!! 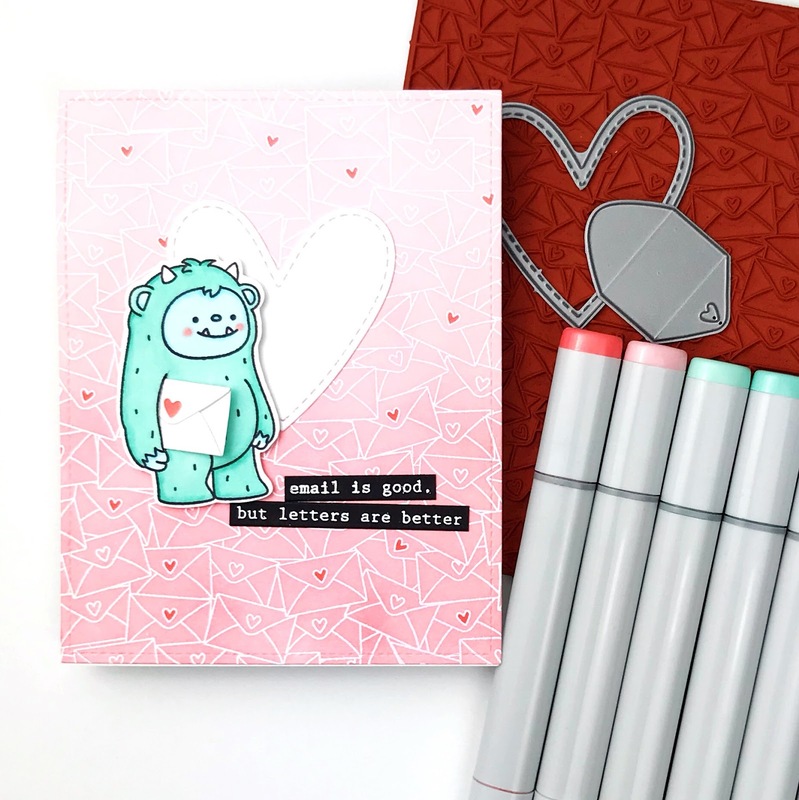 Absolutely adorable card using these terrific new products. Definitely itching to buy!! Finally... Had to move to a different browser to get it to open for comments. Now the picture isn't in front of me and I've forgotten what I was going to say. LOL! Oh, yea... that adorable monster with his letter and the oh-so-true statement against that fab letter background is TERRIFIC! So wonderfully adorable!!!! Beautiful colouring!! This is soooo adorable!! I love the green color of this cute monster and I LOVE how you have the envelope tucked under his arm!! So fun. Thanks to D.Ann C who mentioned switching to a different browser as I wasn't able to comment in Chrome. I love how the yeti is carrying the envelope - he looks like he's on an important mission!